Was the Royal Wedding a right royal waste of tax payers money? It’s easy to see why at first thought that spending an estimated £32m on a wedding is a little OTT when it’s the Royal family (AKA, the tax payer) footing the bill. Why should we pay for it? We don’t know them, they’re not our friends and the vast majority of us aren’t attending. Seems a little ridiculous, right? But then you think about it. That £32m (of which it’s thought £30m was spent on security, which is a winner for everyone involved as that wedding had terror threat written all over it, let’s be honest), has been matched and more in the profits that have come out of it. Profits which are taxable. In fact, of that £32m, you have to consider where it was going. To businesses and services, which for the most part are UK based and therefore some of that will go into VAT, before you get into anything else. And then there's the fact that the Royal Family (which are a business in their own right) paid for 'the core aspects of the wedding, such as the church service, the associated music, flowers, decorations, and the reception afterwards.' So the tax payer wasn't quite as out of pocket as first thought. People flew from around the world and travelled the length of the country to be in Windsor for the wedding. Those people paid money into our transport system, to hotels, to restaurants and shops, just to be there. In fact, I doubt there was an empty hotel room in Windsor that weekend, or a quiet pub or bar. Or a supermarket not having to order in extra bottles of water, convenience food, party snacks and prosecco. And that’s just in Windsor. What about the rest of the country where city centre bars were packed with those making a day of it to watch the wedding as they just love the royals? Or spending their cash throwing parties and BBQs? Or even better, being a guest at the wedding itself as I doubt many of those filling St George’s Chapel weren’t wearing a whole new outfit which came in at a hefty pricetag, a hotel that was sold at a premium rate and everything else on top. Suddenly, (not to take it away from Harry and Meghan as it’s their big day), but the wedding itself is a marketer’s dream. It might have seen some heavy tax-payer investment but the profits to be had out of this outweigh it massively through increased sales from everyone wanting to be a part of it. Think about the companies who make cardboard masks of famous faces? They will have been rubbing their hands with glee – and let’s face it, they probably won’t make that much money again until Prince George ties the knot. Marks and Spencer rebranded as ‘Marks and Sparkle’ for the weekend, ASDA was selling ‘When Harry met Meghan’ tshirts, and that’s before you get to online discounts by every highstreet retailer to encourage us to part with our cash. Behind a lot of this will be creative agencies, evens planner and your every day staff at anywhere doing anything wedding related all earning an additional pretty penny out of the day. And then of course there’s the good that came out of it. 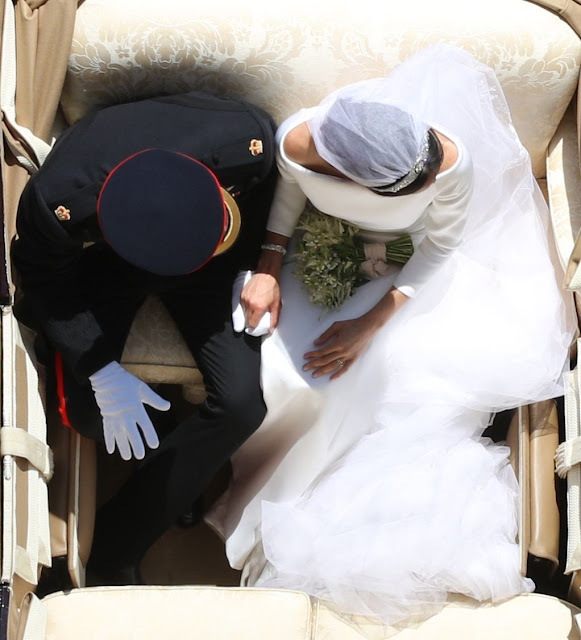 The going against outdated traditions as a mixed race, American and divorced feminist married into the royal family and the defiant step forward in history that the day was. The look on the Queen’s face when Bishop Michael Curry absolutely stole the show in the same way that Pippa’s arse did when Kate and Wills got wed. (He is my hero). The fact that so many people spent time with family and friends to celebrate it. I don’t see any negatives here. Overall, in my oh so humble opinion, I think the royal wedding was an investment in tax payers money. And to all those scrooges whinging that the money could have gone to the NHS? Be realistic, it wouldn’t have happened and you know it. I absolutely agree with you! I think the royal wedding is fabulous, and as a taxpayer myself there are a lot of things that we pay towards that annoys me even more! I like Harry and Meghan, and think that they do an incredible amount for charity and the UK. Personally I loved seeing the creativity of brands like Marks and Spencers and as you say so much money would have come into the UK economy because of the wedding.